Reaching Out | Food It Yourself! As much as DIYeters value self-sufficiency, there are some things that take a community. Kneading a triple batch of bread dough, making pickles, hunting for wild blueberries- some things are easier and more fun with company. Recently, I’ve been focusing on my professional development, and I’ve found help from my network of professional connections (that’s classmates and co-workers for those who don’t speak “corporate English”) is making it easier- and more fun! I created an account on LinkedIn, a site just for building a professional network. Of course my first move was to connect with my existing network (my classmates and co-workers). I also found groups created for people who are interested in the same aspects of food and nutrition that I am: Food Industry Jobs and Nutrition Marketing and Public Relations. This has helped me expand my reach and increase my professional network (meet people who can help me in my career search). If you are looking for a job, or if you have a job, check out LinkedIn and look into expanding your reach. While you’re there, look at my profile. It’s still under construction, but I am also. 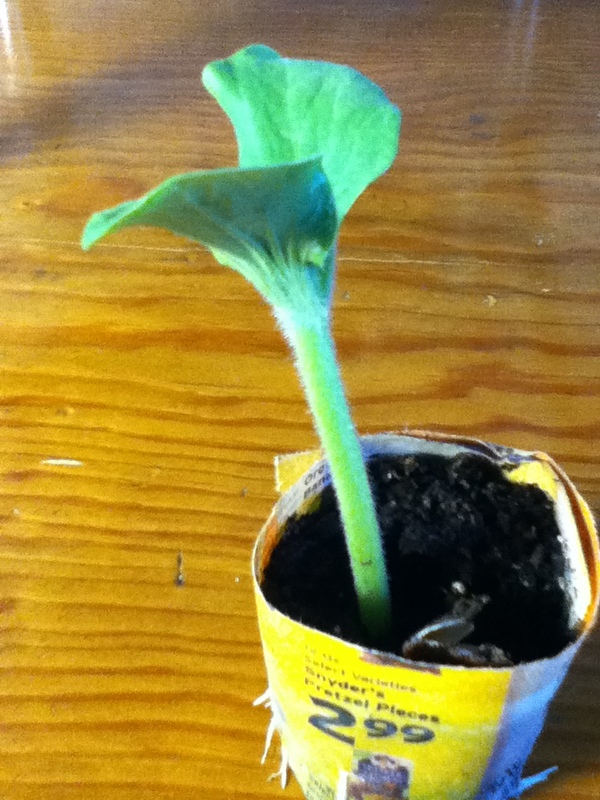 This is a pumpkin sprout. Like me, it has a lot of growing to do this year.